I opened my eyes this morning a little after 5am. My radio alarm clock was playing my radio station softly, not alarmingly. This explains why I slept an extra 40 minutes this morning. It did start me in a rush and as it turns out, the extra 40 minutes might have been a difference maker. Today was right on time despite the late start and the frantic rush to the studio at 6am. I slept 5 hours and although I needed more, that's still on average, an hour more--and sometimes 1.5 hours more than I typically get at night. I say "at night" because I often supplement my sleep with daytime naps. The problem with daytime naps is obvious: It pushes everything back, I end up getting to bed super late and then the pattern repeats again and again. Last night's 5 hours might have been a difference maker. I didn't think I could do it. Between 1 and 2pm, right before calling it a workday, my eyes starting getting super heavy. I felt like I could have slept for hours right there in the studio with the mic in my face and the headphones on. There was a moment where I told myself, you have to nap when you get home!! But then I got up and started moving around. I didn't go for coffee--I just started moving around. I had some errands to run after work, I needed to pay some bills--stop at the bank, those type of things...and I did. And at some point I made the decision that there wouldn't be an afternoon nap. I decided to get home, take care of some business online--change, fix a Shakeology shake, drink it while my phone charged--then head to the YMCA. Oh, by the way-- I stopped at Sonic on the way home for ice and a banana. It's probably the healthiest order I've ever shouted into that little speaker-microphone intercom thingy. I likely confused the kids inside: "Did he say ice cream with banana?" "No, man--I think he said a bag of ice and a banana--you better double check, repeat his order." Yes-- a bag of ice and a single banana, please! I did notice a few of the items on the menu--wow. I grabbed my ice and banana from the carhop, told him to keep the 70 cents change and peeled out of there quickly. Honestly--it wasn't tempting being there, at all. I love what I'm doing, I love what I'm eating, I love how I feel and I love me. I'm content; downright happy. I do not feel the need to comfort myself from indescribable and hard to explain feelings with the new waffle cone sundae. The urge isn't there. The compulsion isn't there. The clarity is there--and it clearly shows me how wonderful life can be when I'm making what one of our weekly conference call support group members calls "righteous food choices!" I feel great about me and my choices. And I refuse to trade this feeling for anything. I left the house for the YMCA and the elliptical machine. On my way, I dialed up the little Mexican place down the street from the Y to order dinner. With my conference call tonight--I decided I wasn't cooking. I ordered the Hawaiian Fajitas without most of the things included in the order. I didn't want the flour tortillas, beans, rice, or their guacamole. I forgot to say "no cheese," but it turns out they didn't include very much. I asked for three plain corn taco shells instead and a side of lettuce. Since I declined most everything that comes with the fajitas, they charged me nearly four dollars less than the usual price! I told them to wait a bit and I would pick it up after my workout. I walked into the restaurant and was greeted with, "How was the workout amigo?" I smiled big, "It was good, very good!" I picked up the fajitas and headed straight for the neighborhood grocery store on the South side of town. I ran in and grabbed some fruit and water, then straight home with just enough time to put dinner on a plate and eat before my 7pm conference call. I was in a groove at this point--right on time! I proved something to myself today. I proved that sometimes when I think there isn't any way I can go on without a nap--I probably need to get up and move around a little and then convince myself of what it is I need to do. Sometimes a nap may actually be the healthiest choice. Not today, though. I felt energized enough to get things done. I powered through my day and made it just fine. I wasn't whipped during my workout either--it was a really good workout! I pushed it well and feel great about making the decision I made to stay up and get things done. Now I can get more rest. I'm getting to bed even earlier and I'll see what 6 to 6.5 hours feels like! This is real progress in the sleep department. And these goals we have, you know it's not about perfection, it's about progress--and when I can see the progress and feel it too, like today's experiences, I must smile--because this is what it's all about. Waffle cone sundaes. Thank you, Sonic. UR too late. You couldn't have done this when I wasn't taking extraordinary care? Out of here, fast! Time to hit the elliptical! Time to give it all I got. Time to sweat. Time to work it. Time to feel that feeling when the endorphins flow. Routine is a big thing for me. I have set routines, habits let's call them, and when those are focused on good things--it works very well. I've very much fallen into some nice routines with food. Many of the "rules" I abide by are not written anywhere--they're just kept, by routine--by habit. Ordering water in a restaurant, it's become a regular and very easy habit--very automatic. Once a month or so, I might order an unsweet tea, but really--it's less than that, maybe once every few months. Water is my restaurant drink order 98% of the time. I've developed some habits with food, too. My eggs in the morning. My love of bean tostadas for lunch. And my Mexican food dependency is obvious. I enjoyed dinner out with my daughter and her boyfriend this evening. I let them pick the place because if they leave it up to me--they know exactly where we'll end up: At that little Mexican place that does the Hawaiian Fajitas. Oh my--how I love those things--or just fajitas in general...love them. My habits usually serve a purpose, don't all? The Mexican food thing is a thing because it tastes good to me, but even more of a reason is the fact that it's so easy to adjust the calories up or down depending on how it's ordered or made at home. I can have a nearly 700 calorie fajita dinner--or slightly over 400 calories, simply by making a few adjustments. I like that kind of flexibility. And I like being creative--and I think I like flirting with things that look like salads, without fully admitting to eating one. Habits within relationships are tough to break. And as my relationship with Heather grows, I'm trying my best to not revert back to old relationship habits or base everything off of old experiences and expectations. My exercise habits have been fairly simple. And I don't mean that in a good way. I mean, simple--as in, I'm fully aware that I'm capable of doing more. The old excuse that I'm somehow trying to protect myself from injury or sudden death doesn't fly anymore. Maybe so at 500 pounds--not so much 200 pounds smaller. But it's that routine of habit that keeps me doing just enough. Despite it all--or rather, thanks to it all, I'm losing weight consistently. So I can't say what I'm doing isn't working--it is, but I must be willing to expand my focus some--branch out and try new things, commit to harder workouts, like weight lifting, and realize I'll be okay. I know I will be okay. My next weigh day will likely (hopefully-optimistically) take me into what is commonly known at Twoterville. I think that's what they call it. And it'll be a sweet descent into the 290's after getting all the way up to the 390's during relapse/regain. I'm feeling really good these days. My workout today was really nice. I did the cycling class at the YMCA. For some reason it isn't registering with fitbit as good as my elliptical workouts or even my 5K brisk walks, which is kind of puzzling to me. Oh well--it's working none the less. And I'm super grateful for that fact. Headed into my local YMCA for a cycling class. They call it cycling because apparently "Spin" is a copyrighted workout. I just call it good! I'm sad to report that Heather and I ran out of time on the video this weekend. My apologies for mentioning it last night--and then not getting it done today! The next time I write about it will be when we have content to post! It was a very busy day. I met Heather's father, step mom of 27 years, brother and sister in law and their 5 year old son. I was a little nervous going in--but once they arrived, it was all good. We had a great visit--even shared several hearty laughs. It couldn't have gone better, in my opinion. I return to my normal work schedule tomorrow after having a weekend off. I feel great about my food and exercise choices this weekend. I hit the Y Friday for the midday spin class--and that felt great. I had an off day from exercise yesterday, but it hit good tonight--even though I was wanting to call it good. Heather said I was pushing her--but she was really pushing me. Had she offered a hint of resistance to our workout tonight--I would have quickly agreed and bailed. But she didn't. And we both did well. She ran and I walked fast. I did maybe 2.5 miles--maybe. She ran 4 miles. We both felt good about it! Once again-- I promise not to mention the video series again until we start posting! Didn't expect the day to be so packed. It got away from us. I sincerely appreciate your patience and understanding. I'm feeling really good. I bought a new shirt yesterday, in advance of this meeting with Heather's dad. I bought a 2XLT. It is way too big. I needed a 1XLT at the most, at least in this particular brand. I wore it anyway. It is a strange thing how our brains are the last to catch up with our changing sizes. About to start a good workout! Brisk walk starts now! I've really enjoyed today. I took the day off. I didn't have any location broadcasts, I didn't have anything at all I needed to do or get done, I just had to relax and enjoy my Saturday. Days like these are rare! When I say I "took the day off," it means I didn't work and I didn't intentionally exercise--although Heather and I did a lot of walking today. Fitbit gave me a tiny bit of calorie adjustment. It wasn't the 700 like yesterday--but it was something and anything was okay with me. When it comes to my food and abstinence from sugar, there's no such thing as a "day off." This is simply how I am and how I choose to live. I must be this aware and absolute about my commitment because of the elements of addiction. If I didn't have "a history," then I suppose I could take a day off from everything--but I will not allow it. And it's not something I miss. The peace, calm and happiness I feel today cannot be made better by any indulgence or excess. I truly believed otherwise for the longest time. I feel better than ever without all the excess--very interesting! It's no big secret: I love Mexican food or "Tex-Mex!" I managed to work corn tortillas into every meal today. I didn't do it on purpose, I swear! It just happened that way. It was a delicious day, for sure! Our plans for me to meet Heather's dad today have been moved to tomorrow, early afternoon. Looking forward to our first YouTube video together! It'll be so much fun! We have plans to do a couple videos, early evening-- tomorrow. It was a great idea to take some time off this weekend. The upcoming weekend schedules will be busy in October! I look forward to writing more another night and I really look forward to sharing a YouTube video with you tomorrow night! The late night in Stillwater last night did not make for a very good start today. I was tired. I managed to get what work I needed to get done, done--and leave the studio early. I had a decision to make--go home and nap in order to be well rested for my location broadcast at the Thompson Square concert later or go to the YMCA for a midday spin class--then come home for lunch and a nap. I made the right choice. I did spin at 11:30am because I knew if I didn't, I wouldn't get a workout in today. I wanted a good workout today. I needed it, not just physically but mentally. My Fitbit calorie adjustment today was 700 calories! I feel really good about this! I feel so wonderful while out in public these days. It goes beyond the slimmer appearance--it's an inner confidence, a calm I've never fully realized before the last several months. I carry myself differently in public. I hold my head high, I don't avoid people and I allow my natural self to be--just be, me...naturally. I don't automatically try to make everyone laugh. I'm perfectly content with just being still. It's a peace and calm. This peace and calm carries over to my food and exercise too. I had a special broadcast from a big concert tonight. I had planned on finding something for dinner at the venue but quickly abandoned that plan when I realized there wasn't anything on their limited menu that I wanted to accept. And it was fine. I was okay. It was a late dinner, for sure--but my breakfast for dinner was over the top delicious! Check out the Tweet below! Heather traveled to me last weekend and I'm traveling to her this weekend. I look forward to spending some more time with her as we get to know one another more. She met my mom last weekend. Tomorrow (Saturday), I get to meet her dad. Wish me luck! I'm hoping Heather and I can make some time to do our first YouTube video together at some point this weekend. If so, it'll be posted Sunday night! Stay tuned! Midday spin class! I'm on it! When I share a post like yesterday's and I get into recalling where I was, it leaves me feeling vulnerable, uneasy--like maybe I shouldn't have shared so much. It took me the better part of the day to get over myself and be okay with yesterday's content. Being straight up real can feel this way at times and it's okay, because it's important for me to never forget how far I took the descent into relapse and most important, it's critical for me to believe I'm never beyond such a detour. If I'm to have the best chance at continued recovery, weight loss and long term maintenance, I must continue to hold sacred the critical elements of my recovery. I also want to express hope for anyone who can relate: Recovery--stopping the regain--getting your life back: It is not impossible, it's not hopeless. It's real and is very much within your reach. Today's schedule was tough. I was busy all day--and planned to go to the OSU-Texas Tech game--in fact, I agreed to be the designated driver for this Thursday night ESPN game in my hometown, and I did drive but I gave up my ticket and decided to spend the evening with mom and getting my workout done instead of going to the game. It's super late, I'm horribly exhausted and I must drop in bed. I had a great visit with mom tonight! We dined at Applebee's and I worked out over by her place, doing a brisk walk around her neighborhood. Getting to the stadium for the pickup and the drive home came a little quicker than I expected, so I had to cut my exercise short. Still, it was an effort. And considering the pace of today's schedule, I'm counting it as good. There's so much more I wanted to write about, but I'll do the best thing and hit the pillow instead. I was terrified. At the height of my regain, flirting once again with 400 pounds, I was worried that my body somehow wouldn't lose weight again. 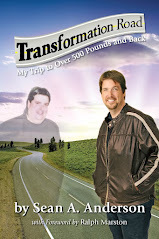 I felt trapped in a brutal cycle of addiction and the resulting weight gain. And I seemed to gain so easily, it really made me wonder if my body could/would respond in the other direction if I gave it an honest effort. 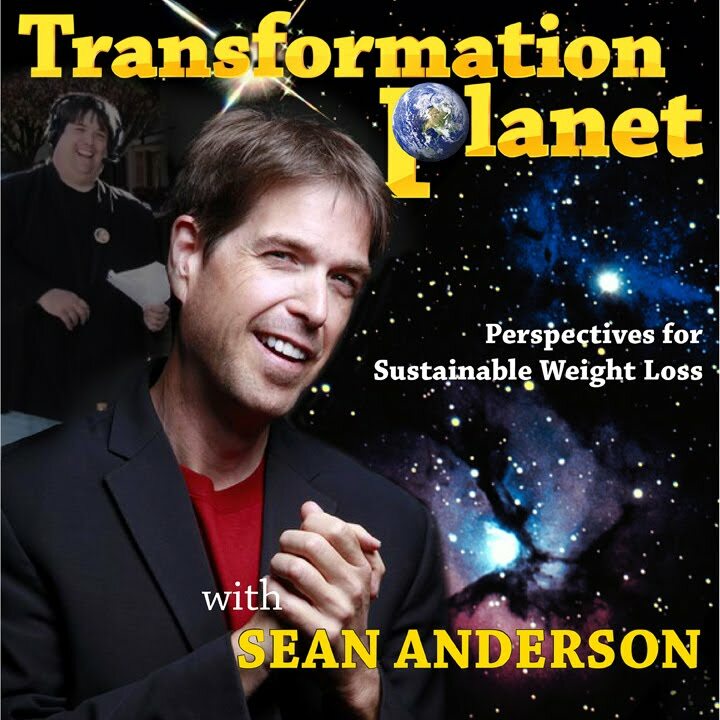 I was in "hiding" in many ways, masked with this persona as "the choosing change guy," yet completely lost, a million miles from the mental, emotional and physical dynamics I once embraced during my initial 275 pound weight loss. The only change I was choosing was the kind quickly destroying me. 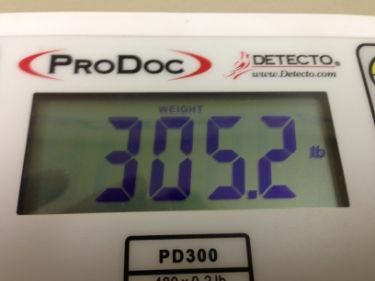 I weighed at my doctors office on April 9th and was horrified by the number 394. I was six pounds away from hitting 400 again. The number depressed me even further. I didn't share my struggles with anyone and those around me everyday could see what was happening--but didn't bring it up very often--and when they did, I would put on a smile and say, "I'm on it!" I wasn't on it. I didn't reach out for support or help of any kind, except for a desperate email to Dr. Marty Lerner in Florida inquiring about the cost of an inpatient 30 day stay for food addiction recovery. I was really scared because it seemed that no matter what I did, I couldn't get it right again. I would do well a day or two, then crash and burn--only to spend another week or so off the rails until another burst of inspiration struck. The worst part for me, was knowing how people found inspiration in my experience, and now I wasn't only letting myself down, in my mind I was letting down everyone who had ever sent an email or left a comment expressing their gratitude for my sharing and how it had helped them. That was very tough. I truly wanted to disappear, delete the blog from the internet, close down my facebook--and just fade away into the distance. I still had the ability to encourage others in a positive way--even mentoring some, with positive results I might add!! But the more I did, the more I felt like a fraud. If they only knew where I was in this moment, the thought frightened me to no end. And all of this negative energy only made matters worse. I didn't enjoy the shake after this email message. "Thank you for saving my life" Who, me?? If Nick only knew where I was and what I was doing in this moment, he would have been shocked. I was slowly killing myself by food, desperate to save my own life and worried I didn't know how this time. I couldn't get Nick's email out of my head. I was at a pivotal point. I had reached out in blog posts prior, trying to share how desperate I had become and vowing to turn it all around--and still, I couldn't seem to make anything work or stick. I prayed, I meditated and I discussed some options with my therapist and with Life Coach Gerri. It was concluded that if I was to get back into a groove of good, I had to do things differently. What worked for me before wasn't enough. I needed a higher level of accountability, I needed to return to daily writing on this blog and I needed to weigh and measure my food. I quickly decided to tweet every bite of food, everyday, as an "extreme" accountability measure. The Twitter decision was a tough one--because the addict side of me was screaming NO!!!!! While the side of me trying to save me from myself was saying, OH YES!! Giving up sugar and committing to the Twitter feed has, without a doubt, been two of the best decisions I've made. Blogging again--everyday, without fail, has been paramount to stopping the regain and turning around what I thought was beyond hope. Nick in the UK, thank you for saving my life! This represents an 11 pound loss, bringing the total to 89 pounds in the last 22 weeks. It's been a dramatic turnaround to say the least. I do know a slow down is coming and my "it will be what it is" attitude will be tested someday soon. I'm overwhelmed with gratitude that all hope wasn't lost and my body was and continues to be capable of losing weight, as long as I'm applying an honest effort and doing the best I can each day. It's never perfect and it doesn't need to be--I'm being consistent, being honest, kind and compassionate toward myself and I'm getting results. I'm a very fortunate person. Crust is Joseph's Pitas. I recently decided to not eat these anymore. I've since reconsidered. Dextrose is the 16th ingredient. Processed! September 23rd, 2014 How Do We Remain Consistent? I couldn't sleep last night because of a nauseous stomach. I'm not sure what was going on. A "touch" of food poisoning, maybe? I don't know. I decided a sick day was in order about 3am. I was able to finally get to sleep and slept in fairly well, but still woke mid-morning feeling sick. I finally decided to prepare some food in order to see how my stomach would react. It felt worse, really, so I decided I needed more sleep. I did feel much better upon waking the second time, mid-afternoon. I took it easy today. I still stayed within the boundaries I've set, of course, but I took a relaxed approach to the day. I was prepared to make this a non-workout day but then, I felt much better after the Tuesday night weight loss support group conference call, so I made the decision to hit the trail for another good 5K brisk walk. This is three 5K days in a row! It's good, because if my Saturday schedule allows, I plan on participating in the Carter's Run for autism 5K Saturday morning. This run is a chip timed event, so I'll have a little more incentive to pick up the pace and get a good time! Speaking of results--tomorrow is my weigh day. I weigh every three weeks. I'm not even going to venture a guess or give it a single thought. It will be what it is and I'll be okay regardless. If I need to tweak my approach, then okay, I will. Whatever I do, I know for sure--I must remain consistent if I want positive momentum. Just finished my 3rd 5K brisk walk in as many days. Cool down... Nice and easy, there we go. I think I had a little of the "post-awesome weekend blues," today. I first experienced this as a kid when grandpa and my uncle would take me to Kansas City to watch the Royals play over Labor Day Weekend. Returning to school on Tuesday after an incredible weekend away was always the toughest thing in adjustment. This same dynamic is commonly referred to as the "post-vacation blues." Yes, it was alive and well today, no doubt! I also felt a little sick to my stomach this afternoon for no obvious reason. It wasn't too bad but it was enough for me to justify a short nap mid afternoon. Of course, with me, these "short naps" have a tendency to become something way beyond a short description. And that's exactly what happened. My plans to workout at the Y late afternoon were changed as I slept the rest of the afternoon away and woke needing to immediately adjust my perspective and plan while fighting off the urge to brutalize myself with negativity over the situation I had created. I decided to prepare dinner, go to the store and do my best to replicate the quality workout of Sunday at the trail. I'm pleased to report I did well with all three facets of my amended plan. It wasn't spinning, swimming and weight training, like I had planned, but it was still active and good. The down side of this situation: It throws my sleep schedule off. I was in bed early last night and felt the benefits of the added sleep throughout my day--until mid-afternoon at least. My workout tonight was a 5K in the park. I had the entire park to myself. I did not see another soul out there--not a car, nobody hanging out--nothing. It was very quiet. It was perfectly calm and cool. I slacked the first lap. Then I turned it on for the last three laps, increasing my intensity with each. It was solid. It felt great. I'm feeling very positive about the upcoming weigh-day Wednesday! I ran across a picture of me with Noah from March and the difference between then and now is dramatic. Noah looks like a completely different baby! And his grandpa looks a little different too. I had the pleasure of taking Noah to his preschool/daycare today. It's amazing how seeing him brightens my entire world. His smile, his wave--oh my, I'm in love with this kid!! I'm seriously looking forward to watching him grow up and being an active part of his life. Taking extraordinary care gives me the best chance of this possibility! I just wrapped up a fantastic weekend! I spent the weekend with Heather and we made the most of our time together. Friday night it was dinner out and live theater in a "thrust" setting, where we were in the front row, literally three feet from the performers during parts of the play. We started Saturday early with a nice walk at the trail, then I was off to do my location broadcast while she hit the streets for her run. Saturday afternoon we dined with mom for a late lunch. It was Heather and Mom's first meeting. The two of them really hit it off! We picked up Heather's daughter at her dorm Saturday evening and headed to the Red Dirt Film Festival for a 6pm screening, followed by a late dinner together. We were exhausted by the time we got back to my place. It felt really good to sleep in today. I actually was up early around 7am, then decided to go back to sleep for awhile. It was needed and appreciated! A late brunch followed, then it was grocery shopping time followed by exercise at the trail. Heather did a four plus mile run and I did a 5K brisk walk. The exercise was amazing. We were joined by Heather's son for a late lunch before they headed back home and I was left to allow the weekend to sink in thoroughly. It flew by pretty fast! What was so good about it was how we went out, we enjoyed the time--but we still made our food and exercise choices important. It wasn't a weekend off by any stretch! It was very natural and enjoyable. My fitbit calorie adjustment in MyFitnessPal shows a record day as far as calories burned with well over 700. Even after ending the day with 1,787 calories, my net calories after exercise is 1,017, or 183 below my target of at least 1200 net. I'm going to be okay with this slight discrepancy today. It was a good day! I did enjoy four meals out over the weekend, however, I'm very confident in my choices. I'm hoping the added sodium isn't too much of a hindrance come weigh day on Wednesday. I have plenty of time to drink more water, flushing it all out between now and then. I'm looking forward to the upcoming week. I plan on getting in the pool again, more elliptical, spinning class at least a time or two and the start of a regular weight training routine at least three times per week. Increased water and more sleep are areas always in need of constant improvement. I'm actually poised to hit the pillow before 10pm tonight. This is a drastic improvement! They keys to this happening: Getting the grocery shopping and workout finished early in the day. There's more I would like to do tonight--like answer some emails and read some blogs, but I'll wait until tomorrow. I need a good night's rest tonight, especially after a busy-fun weekend! This wasn't a relaxed Saturday. It was an enjoyable Saturday, just not relaxed. I had a location broadcast scheduled for 10am and since we were planning to head toward Stillwater immediately after my broadcasts concluded, my workout needed to happen early. Heather and I made our way to the store to pick up some fruit, then it was off to the trail for a brisk 1.7 mile walk. We made it back to the apartment in just enough time to prepare breakfast and grab a shower before my broadcast. Heather finished her run while I was at my broadcast. My FitBit stats show this to be one of the most active days I've had since starting with FitBit. It's giving me a 562 "calorie adjustment" based on measured activity. Today's trip to Stillwater included two meals out, lunch with mom and dinner with Heather's daughter. I did very well at each place. It wasn't too much of an issue. Mexico Joe's has my "go to" chicken fajitas and I found a small 6 oz sirloin at Texas Roadhouse, ordered without butter or any added fat whatsoever. We attended the Red Dirt Film Festival's showing of "The Long Way Home." Being a professional actress, Heather knew many of the people associated with this project. It was pretty cool to watch a film with the actors watching from the seats all around you. We decided a coffee was in order before the drive home. I invested 120 calories in a sugar-free skinny cinnamon dolce latte from Starbucks. It was well worth the drink calories! We both needed the caffeine! I'm planning to sleep in as late as humanly possible tomorrow. It'll be very nice! I'm looking forward to getting back to the YMCA tomorrow afternoon! I've had a very full Friday! Work and cleaning my apartment filled the day, followed by a wonderful date night with Heather. We enjoyed dinner out and the hilarious Noel Coward play Blithe Spirit. My food has been decent today. I felt so much better today. I was back in the groove and looking forward to a wonderful weekend. Heather and I enjoyed live theatre tonight, we're attending The Red Dirt Film Festival tomorrow night and Heather gets to meet mom tomorrow afternoon! After calculating my dinner calories, I'm 150 shy of 1700. And that is okay for tonight. It's too late to eat anything. I thought about a couple of eggs. But really--I'm good. I need sleep! I can't keep my eyes open too much longer. Dinner was my #lastfoodofday Had a wonderful time tonight. It's just too late to eat anything else. Today was a little off, mentally and emotionally. I suppose these days are somewhat normal, after all, everyday will not be equally awesome. Making it through days like these without a binge, without turning to food for comfort and without violating/abandoning the practices and fundamentals bringing us so much good, is a HUGE victory. I don't even know what tilted this day for me. That's what's so puzzling, I just felt "off." Maybe I was tired, perhaps some stressful moments at work triggered this--or maybe I was worrying about my daughters, or mom--or maybe I was missing someone special, I honestly don't know. I do know it affected me from mid-afternoon through this evening. I hurried to the kitchen as soon as I got home today. I wanted a snack of some kind. Maybe I was turning to food? If it was, I did it in a measured way. I weighed out half a serving of blue corn organic tortilla chips and topped it with an 80 calorie slice of muenster, then I proceeded to microwave it until I had a precise 150 calorie, very small portion of cheese nachos. This isn't a typical snack for me. It was good, although it didn't alleviate my unexplained sour mood. Food doesn't fix things like this. Food isn't a therapist. That's really something I must never forget. Remember the incredible Chicken Taco Chili Heather prepared last weekend? A few asked for the recipe and now it's available! Heather added a recipe tab to her blog where you'll find the recipe and another for the homemade taco seasoning it contains. Simply click here to check it out! Tomorrow starts a wonderful weekend! It'll be a busy weekend, for sure-- but very enjoyable. Maybe it'll be just what I need! Turns out, dinner was my #lastfoodofday Writing fast blog update and headed to bed! I never wear pull-over shirts. I haven't since I was a young kid. I'm convinced I was one of the founding originators of the fashion trend of wearing a t-shirt with a button down shirt unbuttoned, over. I was doing that in junior high and high school. I didn't do it because I thought it was a cool way to dress. I did it because I somehow convinced my brain that it made me look smaller and concealed my extra chest fat. I've been given several pull-overs through the years from employers and from special events I've helped promote--and I never wear them. I usually give them away to someone who will wear them--but it's never me. I'm working with a limited wardrobe these days because I refuse to go out and buy a big bunch of clothing that'll be too big in a months time (or less). As I was getting dressed this morning, I realized that my big blue "outer shirt" needs to be donated very soon. It's become ridiculously big. Okay--that doesn't make sense. It's the same size it was when I bought it--I've lost a lot of weight since then and now it looks crazy big on me. It's the shirt I was wearing on stage at the music festival a few weeks ago. That leaves me one "outer shirt" that somewhat fits, but is still slightly big on me. So now what? Should I break down and buy a few things? Or raid my closet to sort through and find some things that might work? I chose to dive into my closet. I found a brand new, never worn, pullover given to me by my employer with our community website logo sewn onto the left breast area. It's a very nice shirt. I tried it on a few months ago when it was originally gifted and it was way too tight. This morning, it was perfect. And even though I've had this hangup my entire adult life, I was able to let it go, be okay--and just be me. It fit and it looked exactly like it should. I received a few compliments on it too, because wearing it really showcases the dramatic weight loss of the last five months. Being "okay" is new to me. It doesn't scare me and I'm not running the other way or dealing with it by eating. I'm okay!! I'm taking a deep breath and relaxing my defensive stance against the misaligned, highly imaginative creations of my brain that try to tell me otherwise. In doing this--these thoughts have lost their power over me. I'm not just pretending to be okay anymore, I'm really, genuinely--authentically, okay! And that's an amazing transformation of perspective. I had a phenomenal food day. Wow. I loved every bit of it, every bite! I can't express how much of a difference it makes to take the time to plan and prepare good food. I made extra and shared with my fellow colleagues today at lunch. It was a wonderful opportunity to discuss what I'm doing and it was a natural conversation fueled by their questions and appreciation for the lunch! It was my pleasure. The Twitter feed I maintain with everything photographed and counted has had a tremendously positive impact on me. It has slowed me down just enough to think about what I'm eating, how much I'm eating and if the lighting is right for the photo. I take pride in my choices. 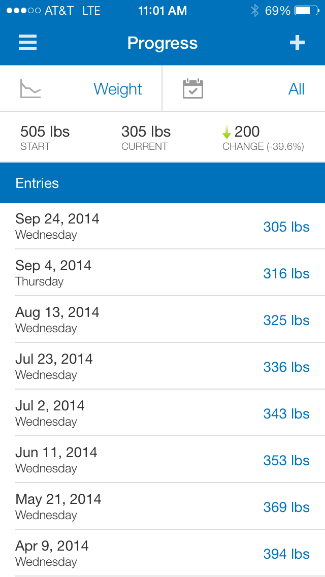 I take pride in my food diary on MyFitnessPal too and it all adds up to a very positive food experience. I do not, in any way, shape or form, feel deprived, left out or cheated. I eat what I love and nothing I don't. Before going abstinent from sugar, I couldn't imagine being able to make such a grand commitment. But I'll tell you, without hesitation or asterisk--It is, hands down--the single most important food decision I've ever made. Giving up sugar has truly helped change my life for the better. It certainly isn't for everybody--and isn't necessary for a lot of people, but folks like me who have addictive reactions to certain foods and substances, stopping the substance--stops the craziness. It's a beautiful thing and I wouldn't trade the peace it's given me for all the sugary treats in the world. My workout on the elliptical this evening was fantastic. I'm "hearing" my girlfriend Heather's voice in my ears telling me I can do more and I deserve more and better. The two of us only get a chance to exercise together once a week at best, but her ability to coach and encourage in the most positive way has stayed with me when we're not together. I may go out and buy some new shirts after-all. Yeah, some pull-overs. I love the way this feels. It's an incredibly good feeling to be at peace with something. I'm in a position along this road where my acceptance has allowed me the most sincere peace. It's acceptance of my abstinence from sugar, it's acceptance of a committed exercise schedule, it's acceptance for not using food to buffer emotions--it's an acceptance of good things and this, coming from me--someone who has had what seems like an inability to accept good things in my life. To finally feel worthy of good things--and to not immediately try to self-sabotage my way back into chaos, is truly the most wonderful transformation within me. I'm an affected individual, there's no doubt, all of us are to a certain extent--some more than others. To finally be able to feel some space between me and those deeply ingrained reactions fueled by an inaccurate perception of self, is incredibly liberating. When I allow my brain to explore the dynamics of it all, I quickly realize the magnitude and how this is about one thousand times more than just weight loss. It goes much deeper than dropping pounds and all the euphoria surrounding weight loss success. To feel worthy of good things, to once and for all embrace and love me as I am, regardless of anything or anyone else and to view myself without judgement and condemnation...oh my-- My friend, this is what it's all about. To get here, to this mental and emotional place where obstacles are swiped away from our path to freedom, is the most beautiful experience. Discussing the fundamentals and surface issues along the way is important, of course-- because the commitment to these--a steady treading of sorts, gives us the balance to go deeper along the way. When I get excited about this journey, it's not always about the most obvious things, like smaller clothes and slimmer profiles. It's about the deep stuff. It's about the transformation of the inside, not the outside that most excites me. Because it's this transformation that lays the foundation for all other transformative experiences to happen and stay that way. Today was an exceptional day for many reasons. It wasn't perfect, never is. But it was positive. I experienced an amazing workout. We had a wonderful conference call support group. I'm simply feeling happy and it shows in just about everything I do these days. Time to move this body to the hip, hip, a hibbity hop, to the beat, yo, you don't stop. #workouttime I'd be an awesome 80's rapper. Word. September 5th, 2014 It's Okay. It's One Day. September 1st, 2014 Why Do I Hold Back?